Bias is a dear friend. We worked together a lot, wrote and had fun. One night he came to my aid at RAK studios, Micky Most's place. I'd been recording backing vocals on Kiki Dees album "Perfect Timing" - it was my song "Wild Eyes" she had covered and he'd done a shedload of keyboards. So, Midnightish and time to head home after a great night.. I step out of RAK, two tiny steps and break my bloody ankle ! With some grace apparently ! They carted me back into the studio and Bias appeared with a champagne bucket full of ice.. ripped my boot off and dunked my poor foot in. Beyond the call of duty, says I ! I was on crutches for a few weeks.. I haven't seen Bias for a while now, hope he's OK . "Where am I Tonight" . . a real gem !! * Hayes is Micky Most's brother Dave. He got this song to Greg Lake who recorded a great version of it on his Maneuvers album. Bias Boshell was a close friend and collaborator who also wrote Kiki Dee's smash hit "I've Got The Music In Me", plus others. As well as Barclay James Harvest and The Moody Blues, Bias has also recorded with Duane Eddy, Kevin Ayers, Sheena Easton and many others..
"Built For Guilt" was written and performed by Chris and produced by Andy. Chris on vocals, Andy on guitars and Bias on keyboards. In the 1980s, Bias became a guest musician for Barclay James Harvest, touring and recording with them. 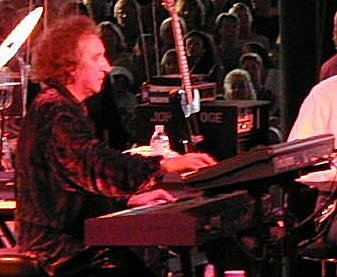 After he ceased to be a guest musician for Barclay James Harvest in 1987, he then moved on to The Moody Blues, becoming their lead keyboard player when Patrick Moraz left the group in 1991.